Most Beautiful royal princess and queens of india-Beautyfull News. 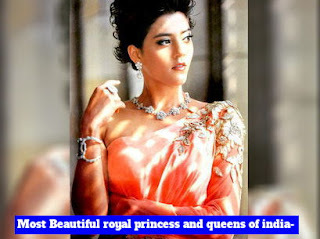 This is the princess of Kashmir model, such is the country's 7 Royal Ladies Profile. Even today there are such monarchs whose members get treatment like Prince and Princess. Most Beautiful royal princess and queens of india. Gwalior On the first day of the year, Jyotiraditya SHINDHIYA, who was 47 years old in the country's Young and Dynamic Politicians. Even today there are such monarchs whose members get treatment like Prince and Princess. STARGLAMOURS.com is talking about some of the country's popular Royal Ladies on this occasion. - Jyotiraditya Scindia's sister, Yuvarani Chitrangada, was married to Vikramaditya Singh, who was associated with the royal family of Jammu and Kashmir. Last year, the daughter of Chitrangada's daughter Princess Mriganka Singh was married to Nirvana Singh, grandson of former CM of Amarinder Singh, who was associated with Patiala's royalty. - Mriganka has graduated from Laassale College of Arts, Singapore. His schooling is from the Vasant Valley School of Delhi. They are models and have been seen in many prestigious fashion magazines. Apart from this, Mriganka is the best player of polo. PM Narendra Modi's rally in Churu, Rajasthan.-latest news.